Looking for a pair of vegan over the knee boots? It's true, they can be sort of difficult to find. But don't worry - we've got you covered! 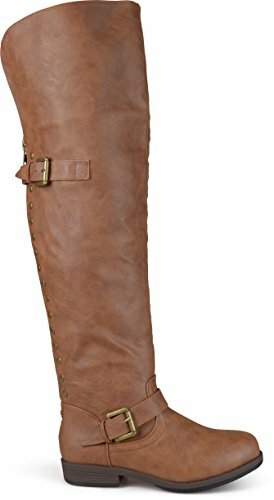 Chestnut color women's faux leather riding boot that rises just over the knee. Has a red and gold zipper with brassy accent studs running down either side of it on the back of the leg. Secure the the fit with two buckled straps: one around the back near the knee and one at the ankle. Made with slightly wrinkled faux leather for a textured, genuine leather look. The block heel is 1" in height, making this boot very walkable. Hidden pockets sewn onto the inside allow you to stow away your phone and money. Advertised as vegan: No, but the description details these boots as faux leather. Pros: Definitely the hidden pockets, especially if you don't have pockets in rest of your ensemble. Easily worn with exposed thigh high socks and jeans or with a hippie dress. Cons: Shaft of the boot might be on the baggy side. Per reviews, the synthetic uppers may get scuffed up fairly easily. 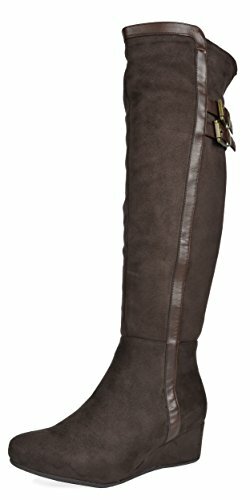 Women's over the knee boot in soft, dark brown faux suede with leather-like trim around the top and on both sides of the shaft. Has thick faux fur lining that's soft and warm. Two brassy buckles near the top control the upper fit. The 2" platform heel is stylishly wrapped in faux suede to match the rest of the boot. Advertised as vegan: No. The materials are described as man-made and faux suede. Pros: Comfortable boots you can wear to a casual work environment. The faux fur lining is so warm and cozy that even winter cold won't get to your feet. Cons: Not very wide in the calves. Some reviewers have said that their feet tend to slip downward inside the boots, although a little extra insole support should fix that. Women's slouchy over the knee boot in eye-catching red faux suede. Balances a classic pointy toe and a chunky wrapped 3" heel for an updated look. Has a partial zipper that starts at the inner sole and extends approximately halfway up the calf. A lightly padded footbed adds comfort. Advertised as vegan: No, but the boots are completely man-made. Pros: Chunky heel for wobble-free walking. These boots seem like they're made for the city and should go perfectly with an oversized shirt dress or a midi skirt with side slits. Cons: Pretty expensive and a bit narrow in the leg. 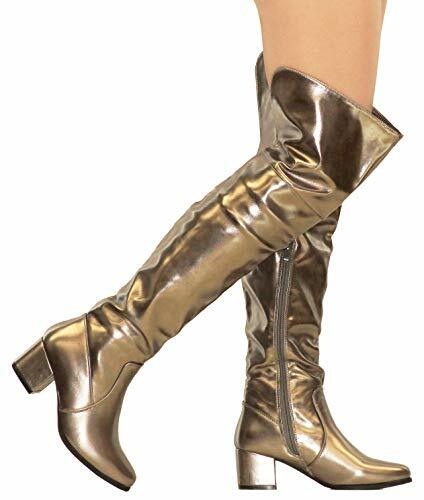 Women's shiny boot that extends well over the knee and dazzles in metallic pewter. A several-inch opening at the back of the knee gives some roominess and flexibility. Inner side zipper running halfway up the boot (starting at the sole) makes it a little easier to get into the boot. Insole cushioning ensures comfortable wear. Has a low, thick heel that can accommodate lots of walking or standing. Pros: Stretchy material should be pretty adaptable. Great price, too. Cons: The description details these boots as wearable in every season, but that's not likely the case unless you live in a fairly mild climate. Women's over the knee boot with a rounded toe in royal blue crushed velvet. Features a 3" chunky wrapped heel. A half zipper extending from the sole to the midway point of the boot should help you slip it on and off. Could be worn with a slightly slouchy look. Advertised as vegan: No. However, the boots are all textile. Pros: Comfy enough to go out dancing in. Velvet has been in style for years — mix and match textiles by pairing these boots with a corduroy skirt or jean shorts. Cons: Another tall boot that's narrow in the legs. Might be more of an occasion look than a versatile one. Women's tall Catwoman stiletto boot in matte black faux leather. Ultra high heel that'll add a good four inches to your total height. Has a semi zipper at the ankle of the boot. Features some stretch that should help get the boot on as well as keep it in place. Advertised as vegan: No, but these boots are made of synthetic leather. Pros: Very fairly priced and totally classic in style. The best part about black boots like these is that you can put them together with virtually anything. A good pair of boots for a night on the town. Cons: Probably not meant for extended use in a single day due to the super high heels. They don't have great inner support, either.